Dentures or “false” teeth are prosthetic devices used for replacing missing teeth. Depending on whether all of the teeth on the jaw line are missing or just some of the teeth, will determine if partial dentures or full dentures are fitted. Just like your natural teeth, dentures provide structural support to help retain the shape of your lips and cheeks while also allowing you to chew food with ease and speak clearly. Dentures help to restore the appearance and function of healthy teeth, while improving your overall facial appearance as well. Dentures can be made of acrylic resin or metal and acrylic. When the decision is made to fit full dentures, any remaining teeth will need to be extracted and then an immediate denture is fitted on the same day. Dentures are custom-made to fit the patient’s mouth using impressions and moulds taken of your teeth and jaw. Once ready, your dentist will fit your removable dentures in an initial fitting, making any adjustments to ensure as much comfort as possible. Some considerations to make with dentures include their susceptibility to move or dislodge while talking or chewing, discomfort or soreness, the need for ongoing maintenance and periodical replacements. Advancements in dental technology and practices have made it possible for patients to get dentures that are fitted to the jawline through dental implants, known as implant retained dentures. Implant retained dentures are a permanent solution to missing teeth that pose no risk of moving or dislodging. At Eastwood Dental, we offer a variety of prosthetic solutions for you to choose from depending on your specific needs. All of our denture products and treatments use advanced technology, materials and processes that ensure safety, comfort, durability and a better fit. 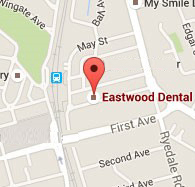 Contact the team at Eastwood Dental on 9874 9900 to find out more about dentures and dental implants.